My six olive trees have borne a great deal of fruit. They are still small, and this year I'm going to keep a sharp eye out for worms. Last year, I tried salt-curing my olives, only to discover that tiny grubs had ruined my crop by boring holes into them and feasting on their flesh. As soon as I pick them, I plan to combine my harvest with Ramshackle Solid's harvest so we can get them crushed into oil at Figueroa Farms. 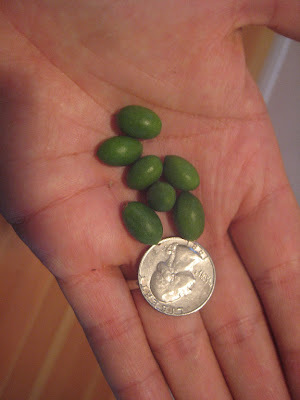 If you have a batch of (non-wormy) olives and would like to pool your olives with ours, let me know!